Customer service directly from the studio owners! 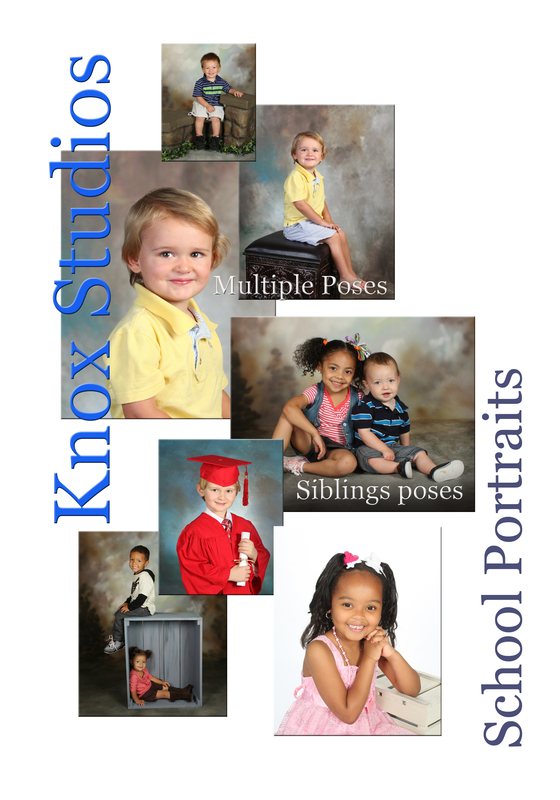 Knox Studios has been providing local schools with quality service since 1987! Since we are a family owned and operated business, we are focused on providing the best customer service possible. Browse around our website, and you will see that we have the experience, staff, and studio facilities on which you can depend. We are offer the latest Digital Photography services to our customers. We have thoroughly tested and trained our staff with the latest cameras and equipment, and are now bringing the many advantages they provide to our preschool program. Listed below are a few of the new services we can provide, making our program the best on the market in this area! We see the images we create as we save them, so we work with the children until we get the best pose possible! 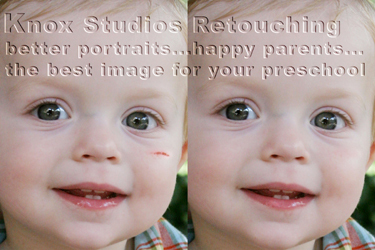 Scrapes and scratches....even the last few chicken pox scars, and food stains on clothing can be retouched, providing great portraits where problems used to occur. No child need be left out of picture day! finally, studio quality portraits for your staff! It would be our pleasure to drop by your preschool at your convenience to show you samples of our work, share references, and answer any questions you may have. Call us at 436-0773 to schedule a visit. We go the extra mile to make your school portrait program an asset to your school. All group portraits have custom titles, color coordinated to the group. Custom vignettes for the group photographs add a professional appearance. Children who are absent or who had difficulty with picture day may be brought to our studio so that the parents can have the portraits they want at the school picture prices. Our staff can take candid photographs of your school for your webpages or promotional literature.We offer a new program in which we can custom design a book promoting your preschool, creating a wonderful image for prospective parents. We can assist in the design of webpages, facebook communications, etc. Simply put, we support our long term customers with the wide variety of services made possible by our highly trained staff.